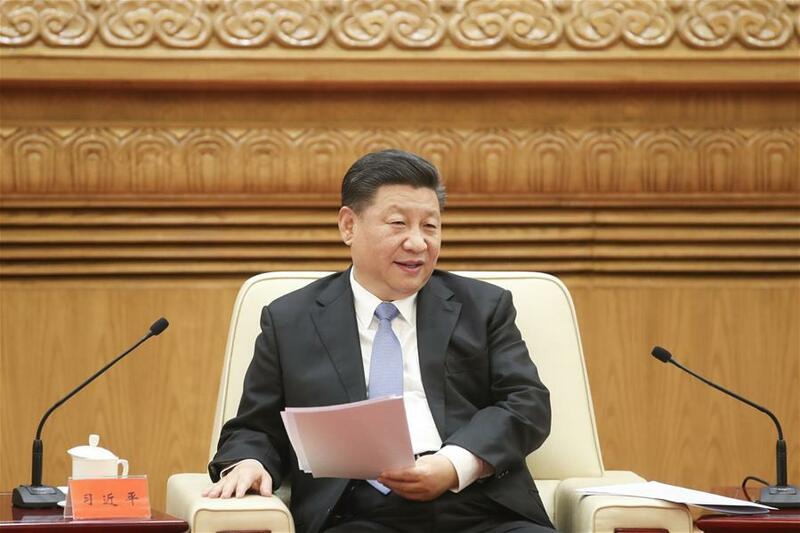 BEIJING, Nov. 12 (Xinhua) -- President Xi Jinping on Monday voiced the hope that Hong Kong and Macao will further develop themselves by embracing the nation's cause of reform and opening-up. Compatriots in Hong Kong and Macao are expected to continue participating in the country's reform and opening-up with sincere patriotism and pioneering spirit, attain the greater development of the two special administrative regions (SARs) by promoting the development of the country, and jointly work for the national rejuvenation, Xi said when meeting with a delegation from the two SARs. Hong Kong and Macao still hold unique positions, have unique strength and will play an irreplaceable role in reform and opening-up in the new era, he stressed. The delegation is visiting Beijing to celebrate the 40th anniversary of reform and opening-up. Vice Premier Han Zheng also attended the meeting. At the meeting, members of the delegation, including Carrie Lam, chief executive of the Hong Kong SAR, and Chui Sai On, chief executive of the Macao SAR, expressed a high degree of recognition of the country's cause of reform and opening-up and the "one country, two systems" principle. They also offered proposals on how to advance the cause and implement the principle. Fully recognizing the contributions made by Hong Kong and Macao compatriots and extending sincere gratitude to them, Xi said the reform and opening-up over the past four decades was a cause that Hong Kong, Macao and the mainland complemented one another on and prospered together with, while the two regions integrated their own development into the overall development of the country. "We should fully understand the roles that Hong Kong and Macao will play in the country's reform and opening-up in the new era, and support them in seizing opportunities and riding the momentum to foster new advantages, play new roles, achieve new development and make new contributions," he said. Xi said he hopes Hong Kong and Macao can contribute to the country's comprehensive opening-up in a more proactive manner, take the lead in attracting capital, technology and talents, and take part in national high-quality economic development and the new round of high-level opening-up. Xi said that Hong Kong and Macao should integrate themselves more proactively into the country's overall development while honing their abilities to foster new momentum for economic growth. Xi said that Hong Kong and Macao should participate in national governance more proactively, stressing that compatriots in Hong Kong and Macao should improve their systems and mechanisms for enforcing China's Constitution and the basic laws of the two SARs in line with the "one country, two systems" principle. Xi called on the two SARs, by taking advantage of their extensive connections with the outside world, to proactively push for more international people-to-people exchange, spread fine traditional Chinese culture and tell China's stories as well as stories related to the successful implementation of the "one country, two systems" principle. He noted that efforts should be made to create more opportunities for young people in Hong Kong and Macao and help them overcome difficulties in their studies, employment and starting up of businesses. While stressing that Hong Kong and Macao will have bright prospects, Xi expressed his hope that compatriots in the two SARs can work together with the mainland to open up new prospects in the "one country, two systems" cause, create a better life for themselves and strive to realize the rejuvenation of the Chinese nation. At the beginning of the meeting, Xi shook hands with members of the delegation and had a group photo with them.